Photoshoots are called for at many different milestones, if you ask my opinion. Contrary to popular belief, weddings, newborn babies and the annual Christmas card are not the only reason to have photos taken. Far from it! Packing up one phase of your life to move into another is an occasion that I believe deserves documenting, in particular if you love the place you’re leaving. This is the life crossroads at which my co-worker and friend Caitlin Adams found herself recently, having outgrown her first “grown-up” pad as she described it. Before she got out the boxes, I’m so glad she thought to call on me and my camera for an at-home photo session. “After four years in this apartment, it was important for me to have photos to remember the space that I held so dear,” explained Caitlin. “I am not from Memphis, so being able to spend four years downtown around such history allowed me to connect with the city in a way I did not expect,” she said of both its physical location and place in her heart. Caitlin’s light-filled, loft-like space made both the perfect subject and backdrop for our photoshoot. From its exposed brick and high ceilings to hardwood floors and open floorplan, the space was perfectly suited for someone with an eye for decoration. Decorate she did, hanging art with an edgy feminine flair, staging fresh flowers in unique vases and stacking coffee table classics covering style, travel and entertaining. “Have fun with your décor!” Caitlin advises if you’re in the market for a similarly personalized look for your home. “Pick up pieces at antique stores, flea markets, local haunts and yes, even things your friends/family giveaway. It’s nice to have pieces that can be a great conversation starter.” You can see what she means in the subtle but meaningful details. It’s likely at least one guest has inquired about her match collection or the unique little stool where it sits. What’s Caitlin’s ultimate recipe for interior success? “I have always found that a comfortable couch, natural light, and bits of personality like books and collectibles really make a space,” she claims proudly, the evidence surrounding her in these photos. To top it all off, her bar cart’s local spirits, plus the gold-rimmed cocktail glasses and record player spinning vinyl gave you the sense that Caitlin was prepared to throw a picturesque party at a moment’s notice. This was the quite the bachelorette pad. 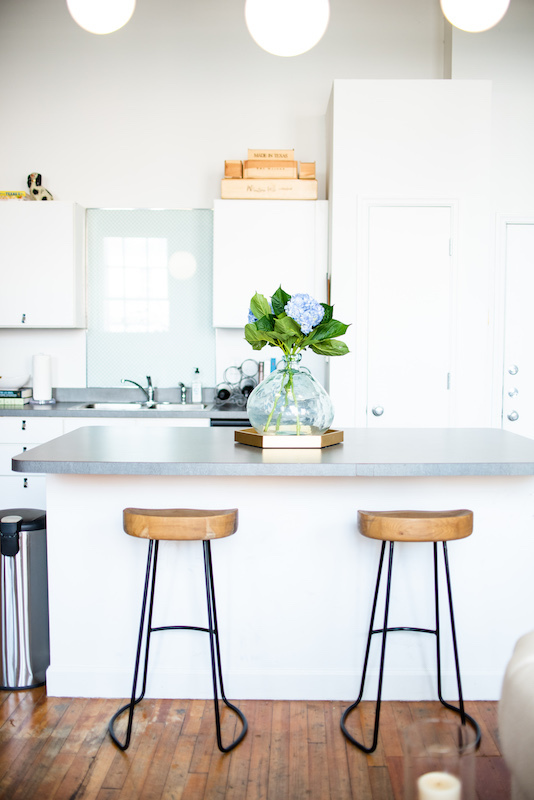 If you ever find yourself, like Caitlin did, moving out of a special spot you called your own for a while, or if you’re just loving how you have your current space decorated, I encourage you to consider an at-home session. Capturing the space where memories are made is an excellent way to treasure the moment.